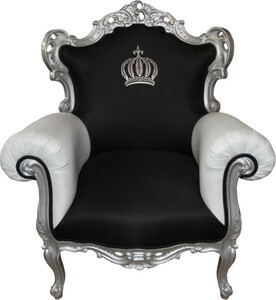 Product information fpr "Pompöös by Casa Padrino luxury baroque armchair black / white / gold - Pompöös baroque armchair designed by Harald Glööckler"
Casa Padrino, your baroque wholesaler from Essen (Germany), presents you here the newest luxury baroque armchair from the collection of Harald Glööckler, the "Prince of Pompöös". Velvety soft and elaborately crafted, a Harald Glööckler designer armchair is a great choice for your living room or waiting area. Let yourself be enchanted by this beautiful baroque armchair and transform your home into your personal oasis of well-being, with a fairytale and noble atmosphere. Bring your own personal Neuschwanstein Castle to your home and reside and revel in pure luxury like King Ludwig II. This sumptuous armchair from the Pompöös by Casa Padrino collection by Harald Glööckler transforms every room into a veritable palace. The gorgeous black, white and gold luxury baroque armchair is an absolute eye-catcher. Technical data for "Pompöös by Casa Padrino luxury baroque armchair black / white / gold - Pompöös baroque armchair designed by Harald Glööckler"
Rating for "Pompöös by Casa Padrino luxury baroque armchair black / white / gold - Pompöös baroque armchair designed by Harald Glööckler"